Dubai, UAE March 13, 2018: International manufacturers of ethically sourced and sustainably produced beauty products are looking to flourish in a Middle East and African (MEA) natural and organic cosmetics market that was estimated to be worth between US$2.25 billion – US$2.5 billion in 2017. The growing global preference for clean, green, and sustainable beauty products has also taken root in the MEA, with analysts TechSci Research indicating the regional market for natural and organic cosmetics could grow annually by 12-15 percent over the next five years. That would place the retail value anywhere between US$4 – US$5 billion by 2022, driven according to TechSci, by increasing consumer awareness and demand for products that are not only better for their health, but better for the environment and society overall. The rising trend has been highlighted by a dedicated Natural and Organic section being introduced for the first time at the upcoming Beautyworld Middle East 2018 exhibition, the wider region’s largest trade fair for beauty products, hair, fragrances, and wellbeing. More than 60 of the 1,600-plus exhibitors at the three-day event will be part of the new section with their certified organic and natural products in tow, from shower gels, body lotions and children’s soaps, to fragrances, facial care products, and professional skincare and makeup lines. “The green beauty business has transformed from a niche market to mainstream,” declared Ahmed Pauwels, CEO of Messe Frankfurt Middle East, organiser of Beautyworld Middle East, which takes place from 8-10 May 2018 at the Dubai International Convention and Exhibition Centre. 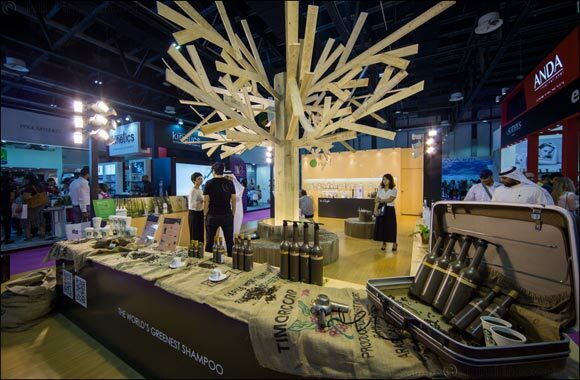 First introduced as a pavilion at Beautyworld Middle East in 2015, Natural & Organics has since flourished into its own major section, joining the show’s other key product groups of Hair, Nails & Salon Supplies; Cosmetics & Skincare; Machinery, Packaging, Raw Materials & Contract Manufacturing; Fragrance Compounds & Finished Fragrances; and Personal Care & Hygiene. Essentiq from Slovenia is a returning exhibitor this year, and will showcase its entire range of ECOGEA-certified organic cosmetics, including the launch of its new professional line of facial products comprising cleansers, bases, concentrates, and serums. Tanja Bozinac, Essentiq’s CEO, said the company identified Asia and the Middle East as its key targeted sales markets through to 2019, and is looking to develop strong distribution networks via its participation at Beautyworld Middle East 2018. “All our products contain 98-99 percent natural or organic ingredients, with the remaining 1-2 percent comprising preservatives, stabilisers and actives, such as vitamins,” said Bozinac, outlining the company’s organic credentials. “We’re constantly following new developments in the areas of bio-technology and natural / organic cosmetics, and we try to integrate the ones that we find sensible. Our goal is to produce high quality products within the frame of a common sense. “We’ll officially launch our professional line at Beautyworld Middle East 2018, and we’re very excited about this, as the line has been developed for several years in close cooperation with 15 Slovenian beauty salons,” added Bozinac. Polish manufacturer YOPE is a debut exhibitor at Beautyworld Middle East’s Natural and Organic section in 2018, and will shine the spotlight on its entire range of natural products, from liquid hand soaps, lotions, hand creams and shower gels, to cleaning agents for bathrooms, floors, windows and kitchens. “Hand soap for children and aromatic candles are our novelties, but this is not the end,” Paweł Kosowicz, YOPE’s CEO said. “We create new, universal products, which make every day better and turn ordinary moments into unique and pleasant ones thanks to their simple functions. “Our products comprise over 90 percent natural and low-processed ingredients. We use natural and delicate ingredients, plant extracts, oils and butters if possible with Ecocert certificates. Kosowicz said the natural and cosmetics market is growing in Poland, and expects similar growth in the Middle East, adding: “Consumers care more about safe and natural ingredients, along with the ecological and environmental aspects of production, packaging and sales. HERLA is another returning exhibitor to Beautyworld Middle East in 2018, having established good contacts and potential partners at the show last year. The Polish producer will launch at the Natural & Organic section its facial skincare lines as well as massage and body lotions. “One of the major beauty trends for 2018 is the ongoing global expansion of the concept of natural beauty products,” said Krystyna Bednarek, HERLA’s President and Owner. “More and more consumers are looking for pure and efficacious products which are gentle and safe for their skin. “As our products contain 88 to 100 percent natural ingredients, we pay attention to this safety and efficacy, and our concept fits in perfectly with the current trends in beauty sector. “All HERLA’s products have passed safety and quality tests, and were approved by dermatologists. They’re free from parabens, artificial colouring, silicones and synthetic detergents, while most of the ingredients are certified as organic,” added Bednarek. Other headline exhibitors at Beautyworld Middle East 2018’s Organic & Natural section include Oxymax from Australia, Italian company Bema Cosmetici, Anaha Lifecare from India, Bionigree from Poland, Romanian producer Skin Novels, and Maydi Frankincense from the UAE. The 23rd edition of the region’s premier beauty showcase will return with inspirational highlights that draw in thousands of professionals every year, such as the Battle of the Barbers, Nail It! By OPI, Quintessence – the art of perfume, the Business in Beauty Summit, and Centre Stage by Nazih Group. Its strong international flavour will also be highlighted by 22 country pavilions from Argentina, Bulgaria, Brazil, China, Japan, France, Germany, Hong Kong, India, Italy, Korea, Morocco, Pakistan, Spain, Taiwan, Thailand, Tunisia, Turkey, UK, the USA, and for the first time in 2018, Russia, and Peru.